Home » More » Main » NSW Premier Barry O’Farrell – liar or just plain stupid? 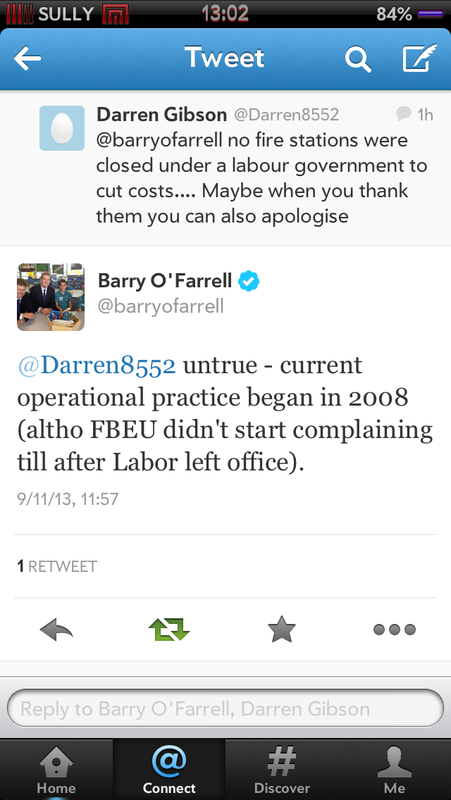 NSW Premier Barry O’Farrell – liar or just plain stupid? Barry O’Farrell, the NSW Premier, tweeted again today that the firefighters union in NSW (FBEU) only started complaining about fire stations closures since the Liberal Government started budget cuts. this follows previous public statements claiming that the FBEU agreed to fire station closures under the ALP. He continues to perpetuate this lie through social media. At first I thought it was ignorance, but given he’s been corrected on this matter (see the January 15, 2013 FBEU newsletter SITREP 2/2013 ), it’s clear he’s just using firefighters as political pawns, and doesn’t care what lies he must tell to look good. The truth is, a limited number of retained (part time) fire stations were arbitrated on by the IRC to be closued temporarily as part of the FBEU/FRNSW 2008 Award work value case. The FBEU opposed the outcome, before and after, but lost in court. It was not a budget cut matter, it was an Award matter. Regardless, the FBEU opposed it, and ran campaigns (with limited success) afterwards. Fast forward to today – station closures forced upon NSW firefighters and the community, without agreement as part of budget cuts. Cuts which have only just started. We are starting to see jobs go at country fire stations, rosters being changed without agreement, and firefighter job losses to come over the next year or so. The point is, that the FBEU opposed closures under the ALP, and we oppose it now. O’Farrell has been corrected on this before and still chooses to push the lie. He’s a Premier and should be held accountable for this type of grubby politics. 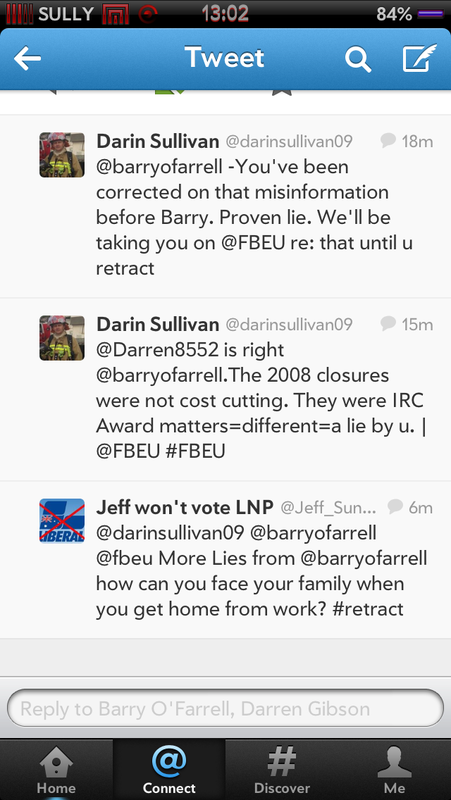 1 Comment on NSW Premier Barry O’Farrell – liar or just plain stupid?